British Columbia, Canada's westernmost province, is famous for its biological diversity. Under the influence of the Pacific Ocean and the mountainous terrain that covers most of the land base, a rich variety of life has merged that is unparalleled in the rest of Canada. Large tracts of relatively undisturbed land support populations of large carnivores and ungulates, the country's only temperate rainforests produce giant trees the height of skyscrapers, and unique populations of fish found nowhere else have evolved since the last ice age. Millions of migrating birds and populations of marine mammals travel along the coast every year, stopping over to feed or rest. Thousands of smaller species that inhabit the wide variety of ecosystems from the sea to the mountain tops go largely unnoticed: insects and amphibians, lichens and reptiles, fungi and flowering plants and more; yet all are important components of British Columbia's natural legacy. 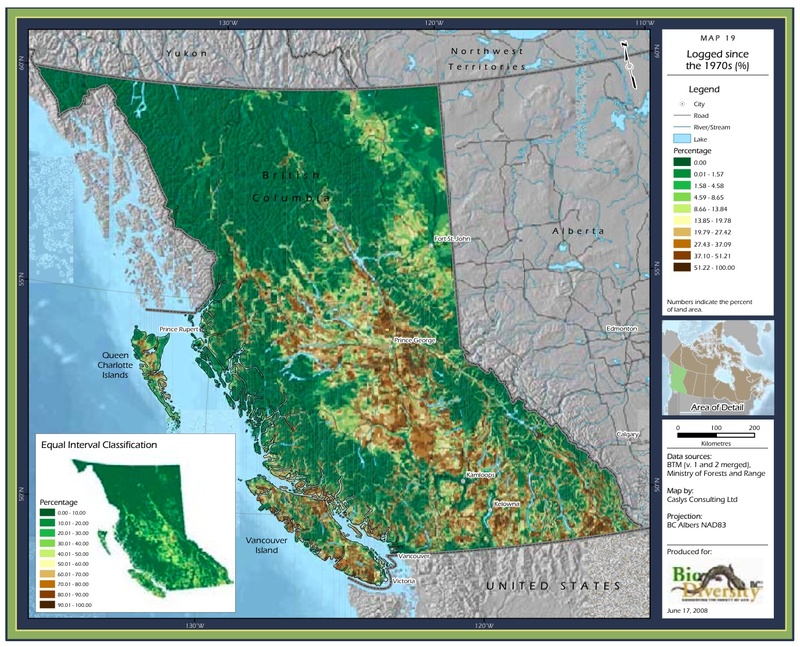 The Biodiversity Atlas of British Columbia provides a map-based province-wide overview of a range of biodiversity components at the ecosystem and species level and for both terrestrial and freshwater systems. Marine ecosystems are being addressed through a parallel federal assessment. With over sixty maps and accompanying text, the Biodiversity Atlas of British Columbia provides a window on B.C. 's diverse ecosystems, the species that live in them, and the elements of British Columbia's biodiversity that make it globally significant. The atlas also presents an in-depth visual perspective of a number of human-induced pressures, including climate change, that are affecting biodiversity in B.C. today. The most extensive spatial analysis exercise related to biodiversity undertaken in the province to date, the atlas brings together current data from numerous sources to summarize information in map form for the full range of terrestrial and freshwater biodiversity. Rarity and richness analyses are applied for the mapping of ecosystems and most well-studied groups of plants and animals. Richness maps are also presented for a number of less-studied groups such as invertebrates and non-vascular plants. The Atlas is a supporting document to Taking Nature's Pulse: The Status of Biodiversity in British Columbia. Taking Nature's Pulse and Ecological Concepts, Principles and Applications to Conservation support the process to identify the actions and priorities for biodiversity conservation and assist conservation managers in both government and non-governmental sectors to make informed decisions about the management of all aspects of biodiversity.